Quick Release Clamp offered by us is manufactured using best grade material and advanced technology. The range of clamp contains lock nut which offers self energizing latch clip and adjustable tension preventing accidental opening. - A small lightweight holder with a powerful magnetic force for temporary attachment in welding and assembly operations. - Model 9401 with three angles i.e, 30o, 90o and 135o and model 9402 with 5 angles i.e, 30o , 45o, 60o, 75o & 90o. - Compactness allows use in tight spaces. Instant clamping device with self-adjusting design. Multi-locations for saddle offers variable forces. Applications: Presses, plastic moulding machines, milling / drilling machines, CNC machining centers. - Strong ratcheting mechanism provides variable clamping pressure. Quick-Release trigger allows for fast and easy positioning and release. The ideal clamp for jobs in workshop, house and garden. Specially designed jaws hold odd-shaped workpieces. Material : Heat treated steel, blackened. Quick Release Clamp availabein SS 304/316 in 16 mm band width, band thickness1.0 mm with quick release mechanism screw. This is globally accepted design for convenient clamping and declamping. These clamps are highly recommended at the places where frequent removal of clamp is required. These type of clamps are ideal in testing equipments as well as marine applications. 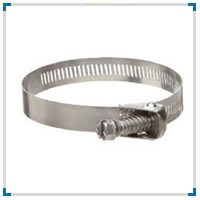 We manufacture and supply Quick Release Pressure Vessel Clamps with various Clamping Lengths of size M24 Clamps both in SS and MS/ Carbon Steel IS1030 and also as per Customers requirement. Also, we manufacture and supply M20 and M16 Clamps. These clamps are used in GLR, Glass Lined Reactors, Manway Clamps, Pressure Vessels, Pressurized Filter Housing, Vacuum Vessels, and Reactor Vessels. This clamp provides a fast and convenient method of securing bundles from .19" (4.8mm) up to .69" (17.5mm) diameter. It is available with adhesive backing or screw applied with one #6 (M3) screw. Clamp & Saddle : High tensile S G Iron, Enameled in Flame Red colour. In order to keep pace with never ending demands of the customers, our company is instrumental in presenting excellent quality assortment of Quick Release Clamp.